Day by day new technologies are born. Predator 21X, produced by Acer is currently the most powerful laptop and technically impressive laptop ever. According to Acer in the 2016 IFA in Berlin, presented this to be the ultimate gaming laptop. It's weight is around 8.8 Kg and it's cost is $8,999, which is approximately $9,000. Wow! this costs more than a brand new car. 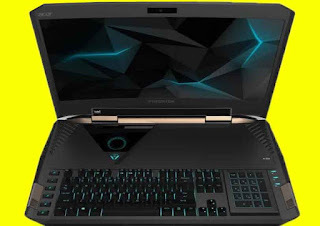 At the time of writting this post, Predator 21X is seen as the world’s most powerful laptop, biggest and heaviest laptop ever. The Display is a 21-in curved (LED illuminated) display. Its resolution is 2560×1080, 120Hz refresh rate ultra-wide curved display and an integrated Tobii eye-tracking. This will allows gamers to aim a weapon, change camera angles or move through a games environment by moving their eyes. 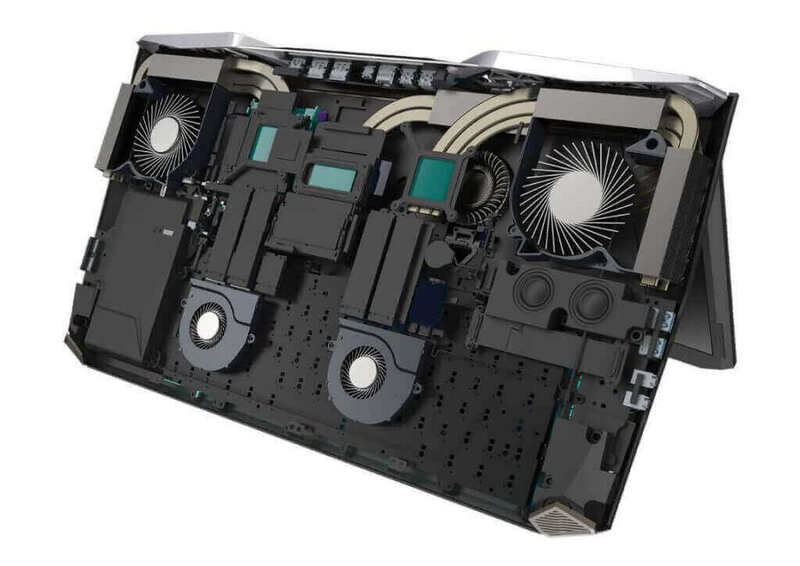 The belly of this monster machine contains two Nvidia GeForce GTX 1080 GPUs which helps to slow the performance of its graphic cards in other to save power. This Laptop requires optimal power for optimal performance. Because of this reason, Acer have added two 300W A.C power adapter. Once plugged in, the GPUs perform at their best. It comes with a DDR4 32GB of RAM and there are also slots to accommodate up to 64GB of DDR4 system memory. More spaces were also provided for up to five storage drives. Thus you have enough space for all your best games and applications. The Predator 21X also comes with a 7th generation Intel Core i7 K-series (overclockable) processor. This guarantees enough power to run any application (games). Cooling is achieved with nine heat pipes and five system fans (three of them being super-slim metal AeroBlade fans for enhanced cooling). They work hard to cool this gaming monster down, no need to say noise will be part of the experience. The fans are aided in their job by Acer’s CoolBoost app. Together they keep Predator 21X cool during heavy duty and enhance performance. The Predator 21X’s full-size mechanical keyboard uses Cherry MX Brown switches with RGB backlighting build into each key. Also, the numeric keypad can be flipped over to become a touchpad. The keyboard is surrounded by four speakers and two subwoofers that will produce a sublime sound effect. Were the problem comes is the battery. 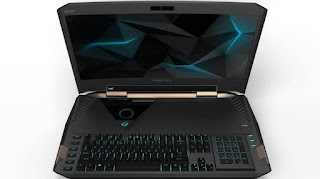 Acer says the battery of the Predator 21X will last up to 3 hours, and this is below average compared to other high-end laptops battery. But we can understand given the power-hungry components the laptop has to run. Also, the battery life will depend on how hard the GPUs have to work to accomplish their task. The Predator 21X, has an HDMI port, two DisplayPort, and the jacks, two USB 3.1 ports and SD card slot etc. Subscribe to our email newsletter and receive updates right in your Email. Feel free to share your comment(s) via comment box below. We will try to response your comment(s) as soon as possible. If your comment is unrelated to this post, please drop it through the Contact Us page HERE . THANK YOU FOR STOPING BY.